Cinder, a cyborg mechanic, is working on the market one day when Prince Kai shows up, asking her to fix his personal android. She agrees, obviously, because he is the prince and well, he is hot. Soon after that, however, Cinder’s stepsister Peony gets infected by letumosis – a plague that has been terrorizing the world for a while, with no known survivors – and gets taken away. Stepmother Adri is outrageous and blames Cinder for Peony’s illness. Therefore, Adri sends Cinder to the palace, where scientists are looking for humans and cyborgs to use in letumosis research, which is just as lethal as catching the plague itself. But, as it turns out, Cinder is immune to the plague. She meets Dr Erland, who runs the research for plague cures. Cinder agrees to take part in the research, but only to find a cure for Peony. A little background info on Queen Levana: she murdered her own sister, Queen Channary, and Channary’s daughter, Princess Selene. She also mutilated her stepdaughter’s (Princess Winter) face because she was more beautiful than Levana. Such fun times. After that, Cinder meets the prince and they like each other *swoon* (even though Kai doesn’t know she’s a cyborg!) and then Cinder goes on trying to fix Kai’s android and visiting Dr Erland and trying to find a cure for Peony and fixing up an old car to escape Adri one day as well. Busy life. When Kai’s father, the Emperor, dies, Queen Levana comes down to Earth to be there for Kai – aka try to force him into marrying her. But meanwhile, Cinder gets Kai’s android to work and finds out that Kai and the android had been searching for Princess Selene – Levana’s niece who was presumably dead, but now turns out to be very much alive. Cinder takes the android to Kai immediately, but unfortunately, at the same time that Queen Levana arrives. Who, even though she’s at a balcony far away, spots Cinder and is suddenly furious. Levana tells Kai that Cinder is, in fact, Lunar, and wants her dead. But obviously, Kai has fallen in love with Cinder by now, and when she returns his android to him, he asks her to the ball. Cinder declines. Dr Erland tells her that she is Lunar. Even though Queen Levana brought an antidote to the plague, Peony dies, and Adri is devastated and angry at Cinder and tells her she can’t go to the ball. But then Cinder finds out that Levana is planning to destroy Earth by marrying Prince Kai and she gets into her now fixed car and races to the palace. She dances with Prince Kai, but then Levana gets there and tries to get Cinder to shoot herself. Kai finds out that Cinder is a cyborg and also Lunar and puts her in jail. Dr Erland stops by Cinder’s cell to tell her the big news: that she’s not only Lunar, but, in fact, Princess Selene, Levana’s niece. He also tells her to escape, which she does. Cyborg: Half human, half android. 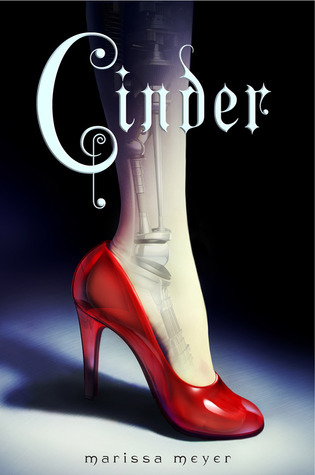 Cinder has a robot foot and hand, but turns out to be almost 40% robot. Which is a lot. Lunar: People living on the moon. Magic: A brainwashing power that only some Lunars possess. I love your recaps. I am not much of a re- reader so I hate waiting a year for new books to come out and then having to re- read the first book. (I only re- read books if I absolutely adored them. I have maybe 4 books I have reread multiple times only. Thanks you so, so much for your amazing job ! I love coming here and refreshing my memory about books that I’ve read… So usefull ! I have a very bad memory, your recaps are absolutely perfect for me ! I feel like there isn’t enough people knowing about this blog and that’s a shame ! Thank you again !